I guess I had already mentioned before that in Philippines spaghetti is a big thing, it is a very popular dish that is never absent on occasions such as birthdays, Christmas dinner or fiestas. This is a quintessential part of the Filipino cuisine hence you see it in most Filipino restaurants in the Philippines or abroad. But how come pasta is included in the Philippine cuisine, we never had any Italian influences at all? First of all let me tell you that apart from the tomatoes and spaghetti noodles in this dish the similarity stops there as the Philippine version is nowhere tasting similar to its Italian counterpart, first of all it is sweet (shockingly sweet for first time consumers), a bit spicy, infused with ham, sausages or hotdog and is laden with lots of garlic. This already removes the Italian roots in the equation, but where might it possibly come from? The Chinese? Indian? American? Or Japanese? Well the closest dish in terms of flavour and ingredients is a pasta dish that came from Japan. Yes! in Japan there is a dish called Naporitan, it is a pasta dish using spaghetti noodles topped with tomato ketchup based sauce alongside other ingredients such as button mushrooms, sausage, bacon and sometimes Tabasco sauce. This in turn was inspired by a dish made out of spaghetti mixed with tomato ketchup served as military rations during the Japanese era GHQ. But if history suggest that Naporitan was inspired by the American rations then most probably we have those same rations in the Philippines on the first place as Americans were in the Philippines since the late 1800’s and American GQH was established only in the 1940’s. 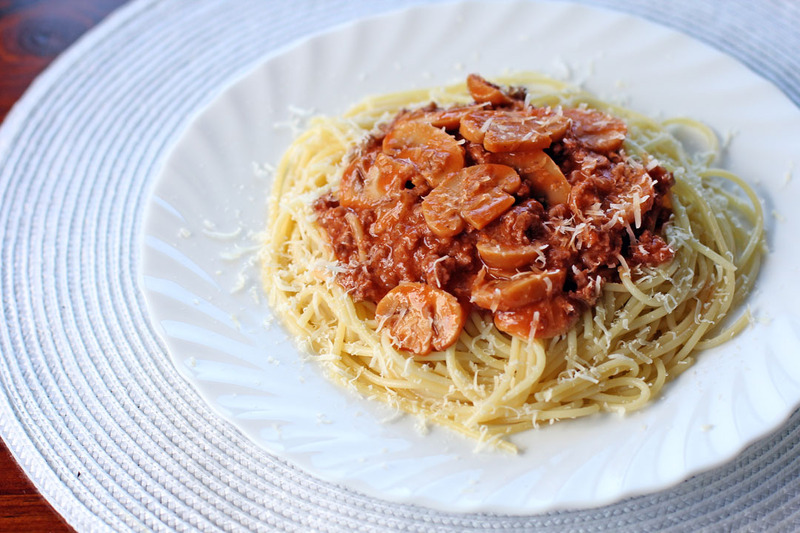 During those times food history in the Philippines was barely recorded hence most of the researchers rely on stories the aging part of the population but what we do know is that the sweet style spaghetti started to become popular in the 1970’s when it was sold in Makati supermarket. There are even claims that this dish is already popular in the Visayas region even before 1970’s when it was sold in wet markets in plastic bags. Well we might not know until now where and when this dish originated but hopefully some good historian would find it out soon. For this post we will not be making the original sweet style spaghetti and if you are looking for it, you can go to this link. What we are posting though is another Filipino style spaghetti, with slight hint of sweetness but what it’s known for is the use of cream of mushrooms yielding a creamy, sweet, savoury and earthy spaghetti. My aunt used to make this a lot when I was younger saying that this is a better and posher alternative to the common Pinoy spaghetti due to its extra ingredients used. I will let you decide on which is better, the choice is yours. In a large pan add oil then sauté garlic and onions. Cook until onions are soft. Add the minced beef and cook until beef turns light brown in colour. Add beef stock bring to a boil and simmer for 10 minutes. Add tomato puree, tomato paste, cream of mushroom and basil. Bring to boil then simmer for 15 minutes in low heat. Add mushrooms and liver spread, cook for 5 minutes. Add more beef stock if sauce becomes too thick. Season with salt, freshly ground black pepper and sugar. Place pasta in a plate then pour sauce on top, sprinkle some parmesan cheese on top before serving. I like the addition of the liver spread. Interesting. The sweetness of the spaghetti makes it even more tasty. I am in love with the first photo!!! That looks DEE-LI-CIOUS!!!! I am pinning it. Yum! Love all the mushroom slices! good history info.. thanks for sharing..
I’m VERY tempted to make this spaghetti tomorrow. 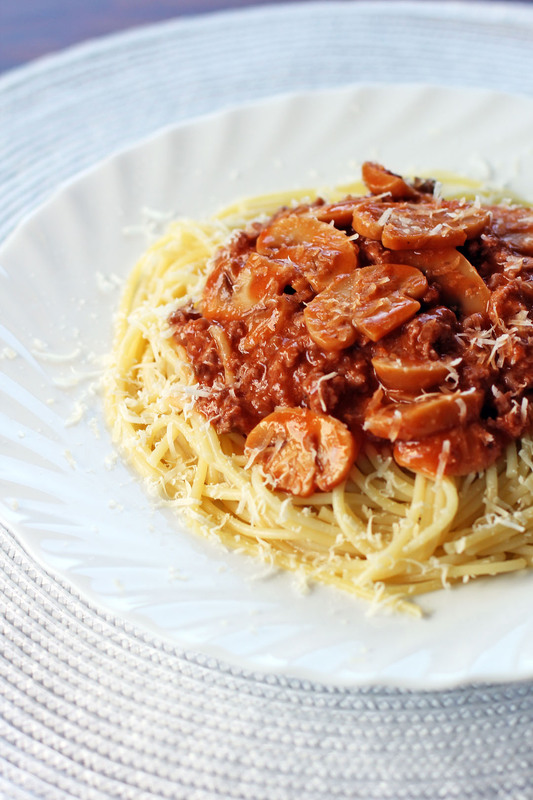 I have a big basket of mushrooms and was debating to use for western meal or Asian meal… and here there is fusion version and I love meat sauce pasta like this. Great timing, and excited to try! So what you are saying is that the only thing you have in common with Italian pasta dishes is that you both use pasta? 🙂 After looking at the ingredients, you could add tomatoes, but after that it gets quite interesting. Liver pate’ in spaghetti. Very interesting. I love this! Lots and lots of different flavors. Delicious!